Love Grows Here » Blog Archive » What a day! So on Monday, we decide to finally take Matthew to get some professional pictures taken…what a trip! First of all, Matthew woke up happy and smiling like he always does, and I was thinking to myself, “We’re gonna get some really cute photos of him today” and I was really excited to take him and so he would be admired by all because he is so cute and adorable, but as soon as we get to the photo place in Babies R Us, he decides that he wants to be grumpy, hungry, and tired. Nothing we tried could get him to smile. 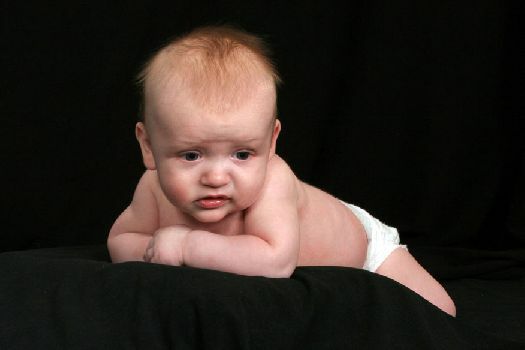 He just ended up frowning and crying through the whole shoot. So, needless to say, after an hour and a half of trying to get him to cooperate, we ended up with 5 ok pictures. So, here is one of the better ones for you to enjoy! This entry was posted on Friday, March 21st, 2008 at 2:14 am and is filed under Uncategorized. You can follow any responses to this entry through the RSS 2.0 feed. You can leave a response, or trackback from your own site.